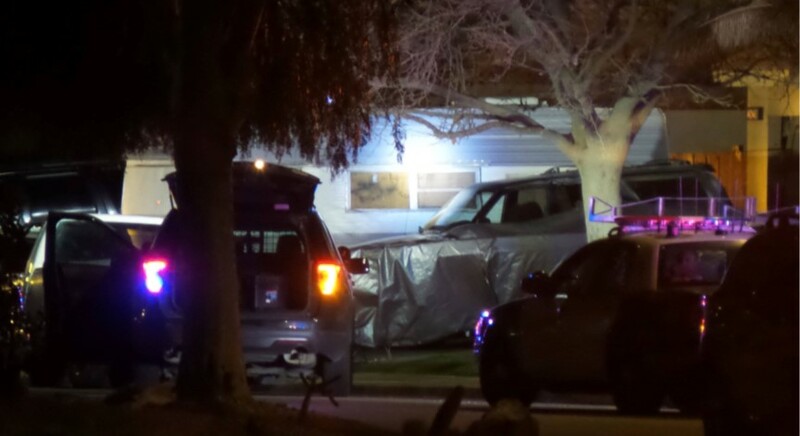 PALMDALE – A man who allegedly pointed a firearm at deputies and was shot before barricading himself inside a trailer in Palmdale was later found dead of apparent gunshot wounds, authorities said. The incident began around 9:15 p.m. Saturday, March 16, when Palmdale Sheriff’s Station deputies responded to the 4000 block of Karling Place after receiving a call for service regarding “an assault with a deadly weapon felony warrant suspect seen at the location,” according to a news release from the Sheriff’s Information Bureau. The suspect was inside a trailer at the location, and when deputies tried to make contact, “the suspect told them he was not going to come out and that he was armed,” the news release states. “Shortly thereafter, the suspect exited the trailer and pointed a firearm at the deputies. A deputy-involved shooting occurred and the suspect then retreated and barricaded himself inside the trailer,” the news release states. The Sheriff’s Special Enforcement Bureau (SEB) and crisis negotiators responded to the scene and made numerous attempts over several hours to persuade the suspect to surrender, but the suspect refused to cooperate and continued to verbally threaten deputies with a firearm, according to the news release. “In order to gain compliance from the suspect, SEB deputies successfully deployed a diversionary device. During the attempt resolution effort, the suspect exited for a second time and a second deputy-involved shooting occurred,” the news release states. “The suspect then fled back into the trailer and was later found deceased by apparent gunshot wounds,” the news release states. The suspect’s identity has not yet been released. No deputies were injured during the incident. Investigators are still processing the scene and no further information was immediately available. UPDATE: The suspect has been identified by the coroner’s office as 49-year-old Timothy John Beckwith of Palmdale. 16 comments for "Barricaded suspect killed in Palmdale [updated]"
Real friends wouldn’t post that they are going to smoke a bowl, or blaze a dab of wax for their dead friend. Reading this report the suspect said I’m injured …. if he was stating he was injured why did he come out the 2nd time and why was it that they fired and he got shot? Again when trying to come out. I have a report with the DOJ personally for harassment and threats against my family from sheriffs across the street whom beat my son after a seizure. I’m just saying nobody knows the state this person was in. I’ve been driven into fear in my own home by friends and family of a relative of lasd…. they have threatened me for neighbors whom have relations with the department. I’ve been run off the road even by lasd cars so that we do not sue… I even had a lasd tell me to move or else. All for owners of the neighborhood club. My own father was a lasd.. then he was a detective for ladistrict attorney.. whom prosecuted Italian mafia.. whom lie in bed with some of these lasd…. not all cops are bad… but I’m curious since in this report the suspect was yelling he was injured… why say your injured and beg for help just to come out and get shot? Somethings wrong here. Brandon Berg… Read the comments from the people that knew him. One says “the next bowl is for you g.” Another says, ” I will blaze a dab of wax for you.” The guy was high (probably meth). When you have friends that will post that they are going to get high for him, well, what do you think? Reread the article. No where does it state the subject announced he was injured or requested help. According to the article he announced he was armed and not coming out, after which he exited the camper, two different times. Perhaps his state of mind could be questioned or perhaps he’d simply decided he wasn’t going back to jail. Regardless, this situation could have had a v different ending if not for the choices Mr. Beckwith made Saturday night. Another dead addict that thinks he was dying a righteous death. Rebel without a cause. RIP Tim, you went out like a champ standing your ground, the next bowl is for you g.
Man only said he was armed. Funny a man is dead? And No Sheriffs were injured. He blazed that dab of wax, therefore he was not in a rational, peaceful mind-set. According to a commenter that will blaze one for him. Wow! I think the Palmdale sheriffs are a little to agrresive. This isn’t the only bad decisions they have made. As a sheriff you are a professional and should know when to lay off the trigger. This should of been a man in jail not dead! Another fine day in the Antelope Valley. We support our Sheriff Department. I hope he had a weapon!!! Sad! !